(Please note: The report may take about a minute to load). This page contains links to opinions, orders, or memoranda from the previous six months. Anyone may download a copy of an opinion, order, or memorandum from this page at no cost or obtain it from the clerk's office for $.50 a page. To preserve the format and style of the original document, the materials are available only in Portable Document Format (PDF). A user must have Adobe Acrobat Reader, which can be downloaded for free from the Adobe website. Specific information about a case, including the entire docket, is available on PACER. Because this page changes, citation to the website is prohibited. You can search by keyword using Ctrl-F or the search feature of your web browser. 3:18-cv-01037-MMH-MCR ORDER granting in part and denying in part  Expedited motion for an immediate order staying third-party discovery, expedited motion to quash subpoenas and/or for a protective order. Signed by Magistrate Judge Monte C. Richardson on 4/8/2019. 04/03/2019 ALBERTIE v. UNITED PARCEL SERVICE, INC.
03/29/2019 Michigan Carpenters' Pension Fund, et. al. v. Rayonier Advanced Materials, Inc., et al. 3:18-cv-01466-MMH-JRK ORDER adopting  Report and Recommendation; denying  Motion for leave to proceed in forma pauperis/affidavit of indigency filed by Mervin G. Rhodes; dismissing case without prejudice. The Clerk of the Court is directed to close the file. 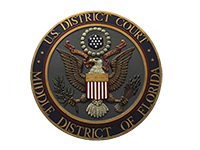 03/19/2019 Eaton v. Winn - Dixie Stores, Inc.
03/18/2019 ALBERTIE v. UNITED PARCEL SERVICE, INC.
3:18-cv-01318-MMH-JBT ORDER adopting  Report and Recommendation; denying  Motion for leave to proceed in forma pauperis/affidavit of indigency filed by Stephen Leonard Guardino, Jr.; dismissing case. The Clerk of the Court is directed to close the file. 3:18-cv-00826-MMH-MCR ORDER adopting  Report and Recommendation; denying  Motion for leave to proceed in forma pauperis/affidavit of indigency filed by Alvin Xex Alvin; dismissing case without prejudice. The Clerk of the Court is directed to close the file. 02/19/2019 Sterling Equipment, Inc. v. St. Johns Ship Building, Inc.
02/01/2019 Sterling Equipment, Inc. v. St. Johns Ship Building, Inc.
12/07/2018 National Trust Insurance Company v. Columbia National Insurance Co.
11/27/2018 Rossetti v. The Rose Group, Inc.
11/09/2018 Carrigg et al v. General R.V. Center, Inc.
11/08/2018 Abdul-Karim v. Wilkinson & Sons Plastering Inc.
3:17-cv-00527-MMH-PDB ORDER denying  Defendant's Motion to Strike Portions of Plaintiff's Statement of Disputed Facts; granting  Defendant's Motion for Summary Judgment. The Clerk of the Court is directed to enter judgment and close the file.